From this week onwards until December, I will be doing Christmas Gift Guide for all the categories of people you may come into contact in real life and also gift for every budget point. In the lineup, currently, we'll have gift guide for the fashionista, the traveler, the beauty addict, the kids, the other half, the couples, mom, dad, kids and so on. If you come back every Saturday and Sunday, you will find new Gift Guides line up all the way until Christmas. This week we will be focusing on gifts for the homies. 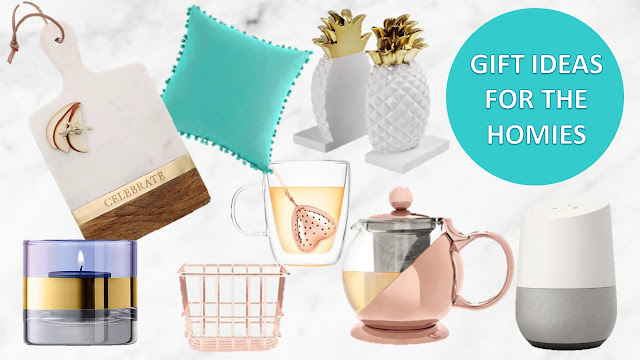 If you're living with a housemate that loves to stay at home, or maybe you wish that the gift might spark some improvement to your home, here are some very good gifts for your housemate. Marble Strapping Cutting Board. $33. Purchase from <<here>>. Lala + Bash 'Elodie' Pom Pillow. $39.90. Purchase from <<here>>. Pineapple bookend with gold hardware. $19.90. Purchase from <<here>>. Bangle glass tealight holder. $29.00. Purchase from <<here>>. Rose gold wire basket. $9.90. Purchase from <<here>>. Rose gold heart tea infuser. $7.99. Purchase from <<here>>. Rose gold Shelby wrapped teapot with infuser. $19.99. Purchase from <<here>>. Google Home. $129. Purchase from <<here>>. The gift guide not necessary applies to only your homies. You can also give it to those who enjoy staying at home (like me!). I really love the rose gold teapot. Which is your favourite item from the list?